I first met Biddy Fraser-Davies back in 2005 when I wrote about her for Cuisine magazine and produced a farming feature for Radio New Zealand. In those days she’d just started producing cheese on her farmlet and no one had heard of her or her much-loved cow, Gwendolyn. She was a real find, great talent with a no-nonsense approach and a cheerful eccentricity that fit her as comfortably as her bright pink crocs. Since then she’s starred on Country Calendar and been written up by numerous magazines and newspapers. Biddy and her milking cows – currently Sally and Molly – are the poster girls of the artisan cheese movement, and, as befits their celebrity status, they’ve just released their own DVD. It’s called Farmhouse Cheese Making: an instructional DVD showing how Cwmglyn Farmhouse Cheese is produced. It features Molly the cow on the cover and stars Biddy the dairymaid in apron and boots. 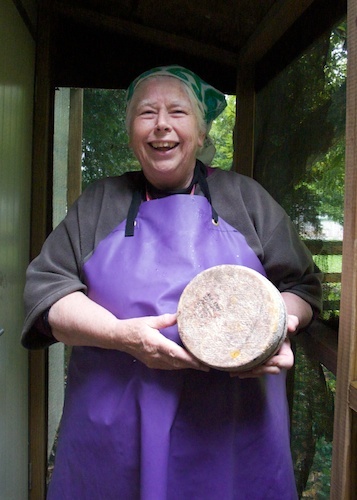 A self-taught cheesemaker, she begins by admitting it took her a full year of trial and error to achieve the consistently good cheeses she sells today. The DVD aims to help others short track the learning process. 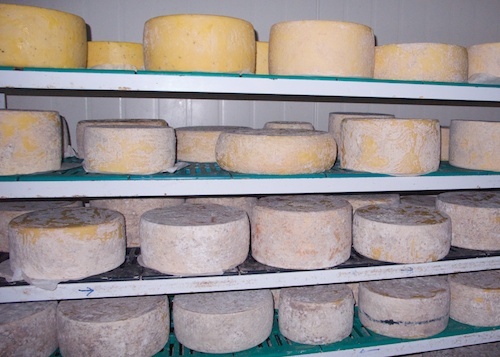 Together with the comprehensive cow-to-cheese manual, which can be found on the Cwmglyn Farm website, it’s an excellent introduction to the cheesemaker’s craft. I learned how to make cheese by attending a class run by Katherine Mowbray. Her courses are very good and I often refer to her book but what I like about Biddy’s DVD is that you can re-run it again and again. 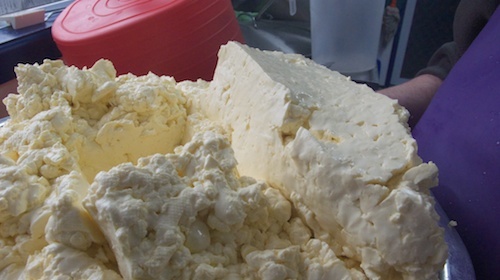 So if you can’t recall how firm the curds should be before you cut them, you can replay the episode. Biddy demonstrates the semi hard, naturally rinded farmhouse cheese she produces herself, but the process is similar for most of the cheeses you’re likely to make. 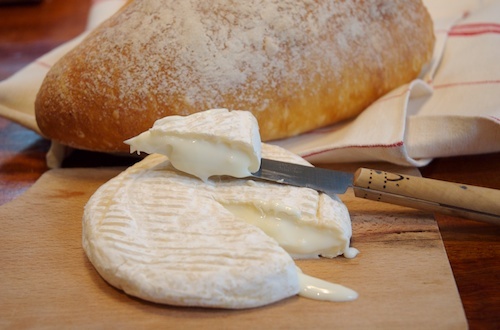 Factors like the type of milk, the culture and temperature all play their part but once you have the feel for the basic technique you can adapt it to recipes for soft white-moulded brie or pungent washed-rind cheeses like Pont l’Eveque. I’m not sure if Biddy has ever been a teacher but I reckon she’s a natural. She manages to cover the technical stuff while making the whole process look as easy as it is – once you know the pitfalls. Listen carefully when she says: “Now this is important…” and you’ll avoid the mistakes that most of us make. 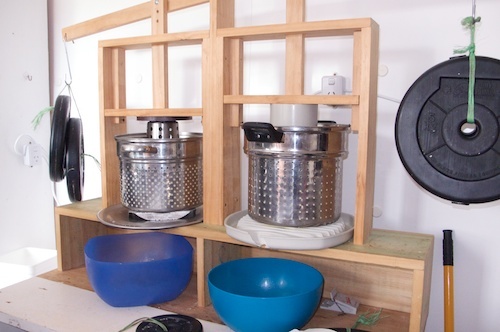 Her own small cheesery is purpose-built and licensed for commercial production but much of her equipment has been adapted from every-day utensils – coffee filters are used to strain the milk and a perforated pasta cooker stands in for a cheese mould. Tips like this demystify the process and make the point that cheese making doesn’t have to be expensive. If there’s one thing I’ve learned – and Biddy emphasises this again and again – it’s that you really do have to be super hygienic. The last lot of cheese Dan and I made got infected with blue mould and I’ve had nasty pink spots ruin the virginal bloom of an otherwise perfect goat camembert. But most of the time we get it right and sometimes our little cheeses are good enough to photograph. I watched France take on New Zealand the other day – not on a muddy field but in the elegant surroundings of the French ambassador’s residence in Wellington. Still smarting from the Eden Park loss a few days before, the French pulled out all the stops in the kitchen, pitching Le Cordon Bleu chef Philippe Clergue against our own Martin Bosley. 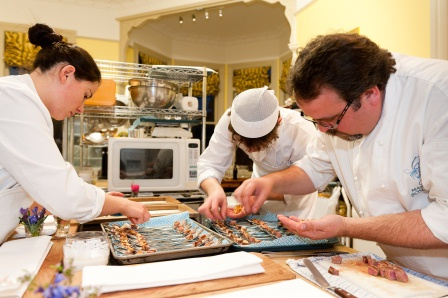 With a team of helpers in the kitchen the two chefs each prepared five amuse-bouche sized tastes based on New Zealand ingredients. In a nice twist, each one was matched with a wine from the rival country, chosen by Chris Archer of Archer McRae and Alastair Morris of Regional Wines and Spirits. 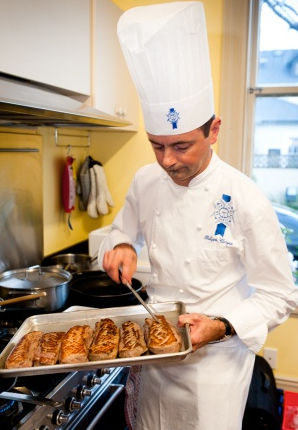 Le Cordon Bleu event at the French Residency, Thorndon. The match started with a Dumangin champagne and a Palliser Estate methode traditionelle, the bubbles replacing the rugby match anthems. Similarly, there was no intimidating haka but chef Clergue did manage to gain an early psychological advantage with the impressive height of his hat. Bosley admitted to being completely outclassed on that score. As to the food. 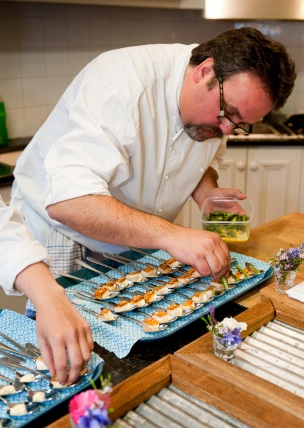 The French kicked off by showing us exactly what to do with our greenshell mussels. Clergue presented a crunchy croquette, or ‘cromesquis’, with a velvety sauce that hinted of crustacean. It was matched with a Cambridge Road Arohanui Rose 2009. Bosley retaliated with snapper on cauliflower puree with asparagus and almond caramel, his try was trickier but not as succesful. The wine was a new one on me, a 2009 Picpoul de Pinet from the Languedoc, a lovely match with the fish. The second round was salmon. 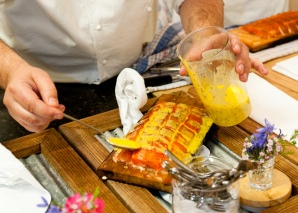 Bosley’s was a mini version of his famous cedar planked salmon, served with a chive citrus emulsion and a sprinkling of wasabi flying fish caviar. Texturally brilliant and quite different to Clergue’s rendition. The Frenchman served his salmon raw. 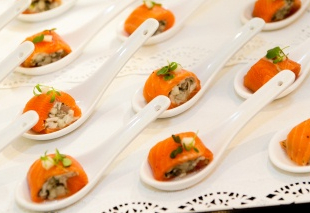 It was thinly sliced, silky textured, and it was wrapped around a delicious oyster tartare. Both were superb. Lamb was next. 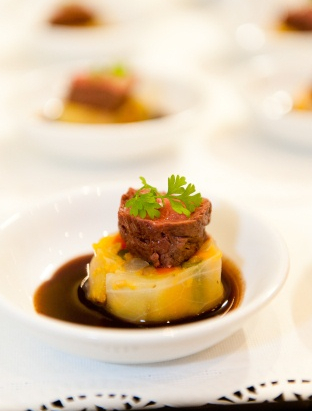 Clergue partered his saddle of lamb with sweetbreads and fondant potatoes. Chef Bosley presented confit lamb loin, topped with fennel pollen and a Jerusalem artichoke crisp. It won my vote for dish of the match. And I’d love to know how he got hold of the pollen – did he shake it off the flowers himself or has he trained a few bees to do the job for him? Either way, you have to admire his commitment. The beef fillet was too close to call. 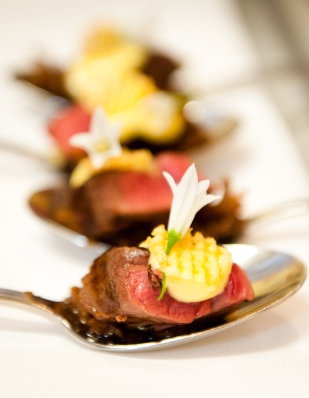 Bosley’s was a riff on steak béarnaise, topped with a gaufrette potato crisp. Clergue partnered his with chestnuts and a hint of juniper in a spiced wine sauce. A Dry River Gewurtztraminer was possibly my wine of the night (I gave it 2 ticks so it must have been good) It matched Clergue’s orange crème brulée, which for classic simplicity beat Bosley’s more intriguing dessert – a combination of orange and pickled radish dressed with honey and yoghurt. Overall winner? Our hosts were too diplomatic to hold a formal vote but I reckon France won by a whisker. Let’s hope they don’t do the same on the field.